Use the form below to inquire about Eco Lodge at Vijaypur . Use the form below to reserve for Eco Lodge at Vijaypur . There are two Eco-Huts having 2 rooms each. The huts are made of mud, wood, and bamboo. 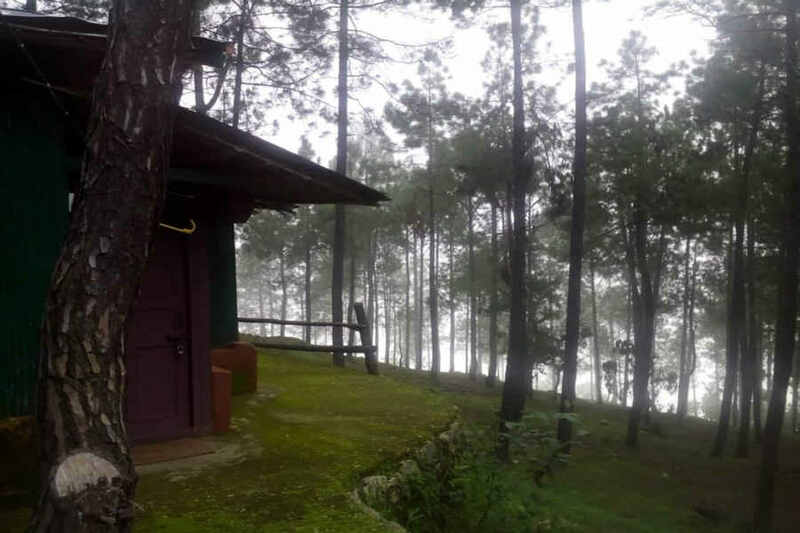 Lose yourself in the beauty of the Himalayas at this Eco Lodge at Vijaypur in Kumaon sitting at an altitude of 6,750 ft. Situated about 75 km from Binsar, this Eco Lodge at Vijaypur offers fantastic views of the Himalayan peaks enveloped by fluffy white clouds and makes you feel as if you are in the middle of nowhere. The lodge sits amidst pine, oak, and chestnut trees with the mist and lush green surroundings making for an enchanting blanket of mesmerizing visuals around the property. Temples and a tea estate in the neighborhood add to the simplicity and charisma of this countryside hideout. The exterior of the main building is authentically rustic and in tune with its surroundings. Thatched roofs, log walls, and rustic lanterns create the perfect ambiance for a luxurious and charming vacation. The colors of this Eco Lodge at Vijaypur in Kumaon have been chosen to seamlessly merge it with the natural hues of the terrain. The walls of the restaurant in the main building are of mud making you feel as if you have traveled back in time. The massive glass windows of the restaurant bring in every bit of nature while you indulge in mouth watering local, Indian, and global cuisines. As the sun goes down and the horizon turns a deep orange, a flaming bonfire is the best way to enjoy the chilly mist blanketing the area. The property has a total of six rooms of which two are in the main building which offer spectacular views of the tea estates and humongous pine, oak, and chestnut trees. The other four immaculately maintained rooms are spread across two eco-huts. The decor of the rooms at this Eco Lodge at Vijaypur is luxurious and in keeping with the rustic theme. All the elements come together effortlessly to make this the perfect getaway to create some precious memories. The lodge is pet-friendly and welcomes pets at a flat charge of INR 250 per day in the Eco-huts. Pets are allowed provided that they stay off the furniture and linen and the owner ensures their safety and the safety of other guests at the homestay. Walk, walk, and walk some more. This is one of the best things to do while in the lap of the mountains. The beautiful and undulating Himalayan terrain around the property is a great opportunity to set out on walks and hikes along the river. Take along a packed picnic lunch and enjoy it in a scenic spot. Warming yourself by the bonfire on chilly evenings as the stars twinkle in the sky is something you do not get to do often in a city. Apart from communing with nature, try a stroll through the streets of Vijaypur. The shops, old historical houses, tea gardens, and an almost defunct tea factory offer a rewarding experience. You might even get to see how tea is handmade. The famous soap stone quarry is just few minutes walk from the property as is the popular Dhaulinag temple which dates back thousands of years. It is believed that this shrine has been in existence from before the Vedic Age. Go on a midnight walk to experience how it feels to be in the middle of nowhere! Zero traffic, the serenity, and only the sounds of nature for company make it a truly memorable experience. Pantnagar Airport is the closest at 250 km and has direct flights from Delhi. Dehradun Airport is located around 450 km away while Indira Gandhi International Airport, Delhi, is about 470 km away. Nainital is 173 km away while Kathgodam is at a distance of 180 km along NH109. New Delhi is accessible via NH9 at a distance of about 458 km.